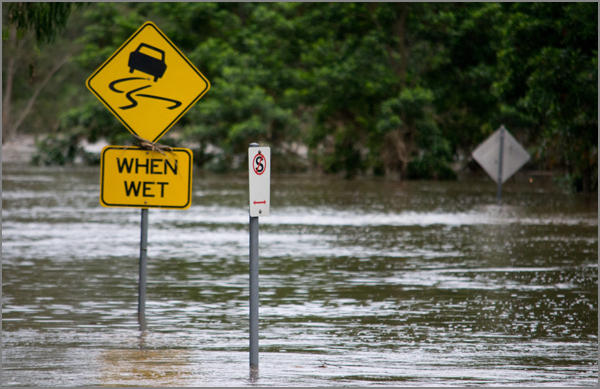 The current floods in Queensland and northern NSW have caused mass evacuations and four deaths. Livestock and crop losses are huge. In Bundaberg alone, more than 2,000 homes were inundated, 40 beyond repair. Roads, rail lines, electricity and fresh water services have been cut. The estimated damage bill in Queensland is well past the billion dollar mark. The response of communities, volunteers, the police and the armed services has been tremendous. Nevertheless, there are very serious long-term implications arising from these events for residents in the affected areas and for the Australian people as a whole, particularly regarding the response of the insurance industry and the state governments to the crisis. After the 2011 floods, insurance companies disputed hundreds of claims, sometimes arguing that the validity of a claim depended on whether floods were involved or just excessive rain. The flood definition has now been amended, in order to avoid such disputes. However, plenty of claims are still disputed for other reasons, and at least one insurance company is refusing to insure homes in flood-affected Roma and Emerald. Premiums for flood-prone areas are now beyond the reach of many residents. Coverage for one home was reported to have risen from $950 before the 2011 floods to $2,200 per annum, with a claim limit of $15,000. One insurance executive has estimated that only one in four victims of the current crisis has flood insurance. Moreover, some companies are extending the higher premium rates to homes beyond flood-affected areas. Paul Pisasale, mayor of Ipswich, claims his premiums have skyrocketed, even though his own house is on the city’s highest ground. And finally, in some areas insurance companies are refusing to offer coverage at all, leaving residents with the bitter choice of moving out or facing disaster. The insurance industry has complained bitterly that the damage bill would not have been nearly as high if more weirs, barrages and levees had been constructed by government. That’s undoubtedly true, but it doesn’t excuse insurance companies from meeting the responsibilities to their clients. What are the governments doing? Many questions concerning governments arise from the current flood crisis, for example how developers got governments to permit the construction of so many houses in flood-risk areas. After the 2011 floods, the federal government’s National Disaster Insurance Review recommended that it bear part of the cost of providing cover for existing flood-prone homes. However, this has not been implemented. Nor has the Queensland premier’s suggestion of the reintroduction of a nationwide flood levy to subsidise reconstruction works A far better solution would be for the government to pay for the works by reallocating funds set aside for questionable projects, and to set up a national insurance scheme offering low-cost basic home insurance coverage. Insurance companies should be required by law to offer coverage to any homes that have been insured to date, with premiums capped, until the homes are relocated or rebuilt on higher ground. According to the Australian Financial Review, high risk flood cover for some properties can rise to $20,000 per annum, yet 85 percent of households now have flood insurance, and insurance executives have admitted privately that more than 90 percent of those homes do not carry virtually no risk of flooding. Governments will also need to review the extent of flood-prone areas, and to assist in the relocation of houses from those locations to higher ground. But governments must not only deal with the current situation, but also long-term implications. The Queensland and NSW premiers have assiduously organised relief efforts and visited flood-hit areas – after all, that’s part of their job – but neither are willing to discuss the long-term implications. Last week NSW premier Barry O’Farrell lost his temper during a TV interview, claiming he should not have to respond to questions about climate change while he was dealing with a flood crisis. “Gimme a break”, he snarled. But even as he spoke, emergency crews were struggling to contain fierce bushfires in Victoria. Last month the national average temperature was a record 36.9 degrees and the highest national daily temperature for the month was 40.3 degrees, also a record. When interviewed on ABC TV recently, a Queensland man said that in the last ten years his town had experienced “once in a hundred year” weather events six times. The increasing frequency and ferocity of Australia’s floods and fires are entirely consistent with climatologists’ predictions concerning climate change and extreme weather events. The Queensland coast now has many new ports for loading mining cargoes, particularly coal. At the same time the federal government has been struggling to dissuade the UN from declaring the Great Barrier Reef an endangered World Heritage site because of the extra shipping and pollution from the ports. Meanwhile, mining corporations have been discharging waste water from their mines into the floods, The Queensland Environment Minister denied this had contributed to the crisis, and Premier Campbell Newman declared proudly: “We’re in the coal business.” Queensland homes will be subject to temporary water restrictions, but not industry. The Greens have recommended the imposition of a 50 percent tax on every dollar earned over one million dollars, to cover reconstruction costs. In contrast, when federal opposition leader Tony Abbott publicly discussed the flood crisis last week he said virtually nothing about dealing with national emergencies, except that he would be better at the job than the current prime minister. If the Gillard government wins September’s federal election there is at least a chance that some action will be taken to address the long-term issues of climate change, especially if the government still depends on a coalition with the Greens and independents. However, if the conservative coalition takes power the prospects for such action are virtually nil. We must take every action to ensure that doesn’t happen.